It was a night of waiting for patrons at the much anticipated House of Marley concert at the Hasely Crawford Stadium on Thursday night. Many turned up at 7 pm, expecting gates to be opened early for the advertised 9 pm start, but they weren’t allowed into the venue until 10.30 pm. The opening acts included eight-time Road March winner Superblue, his daughter Fay Ann Lyons-Alvarez and Bunji Garlin and Collis Duranty, who put the audience in the mood for the big reggae acts. But more waiting ensued, and after an hour-long delay, patrons were heard grumbling that the headline acts were taking too long to hit the stage. However, when Ky-Mani Marley appeared onstage at around 1 am, the atmosphere changed, as he wasted no time getting into his hits. By the third song of his 30-minute set, Ky-Mani had the crowd totally engrossed and grooving to some of his late father Bob’s greatest hits like Is This Love and Redemption Song. After the hype of Ky-Mani’s performance, there was another 45-minute wait before Damian ‘Junior Gong’ Marley graced the stage. “They are killing the vibes,” one disappointed fan told the T&T Guardian while another felt the promoters could have created a better atmosphere by including more local reggae acts. However, an apparent diehard fan from Penal—a Rastafarian with long dreadlocks hanging loosely down his back and dressed in traditional Rastafari colours—felt the concert was an auspicious occasion. 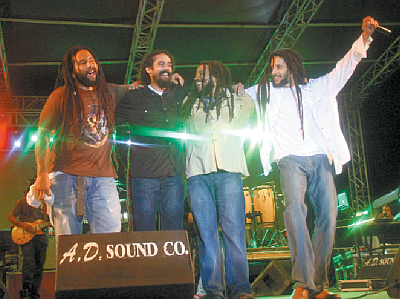 “I am happy to get four Marley brothers on one stage. We are real fortunate. This is history and we may not get this opportunity again, so I good.” At about 2.15 am, Damian was welcomed with loud screams and applause and he didn’t disappoint as he put down an energetic performance. He sang old and new hits, and wowed the crowd who obeyed his every call to action as he thrilled them with his characteristic clear, crisp voice.